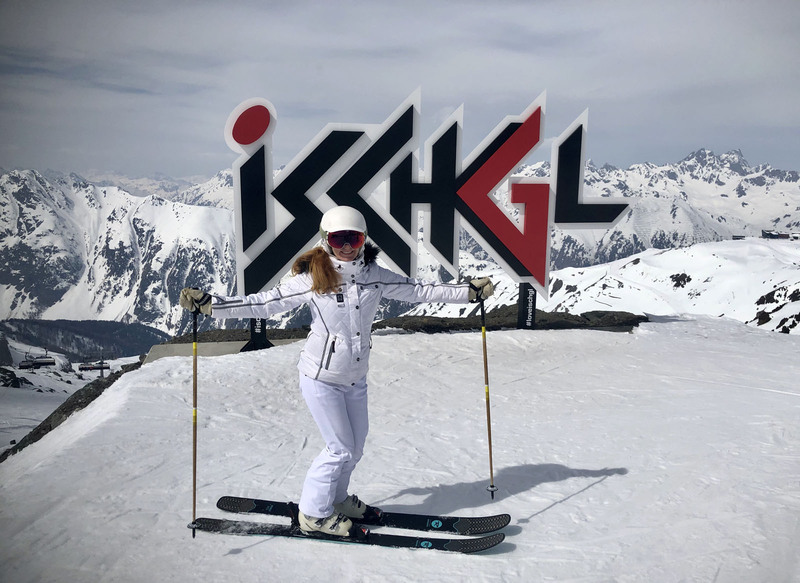 Ischgl is hard to pronounce and amazing to ski. 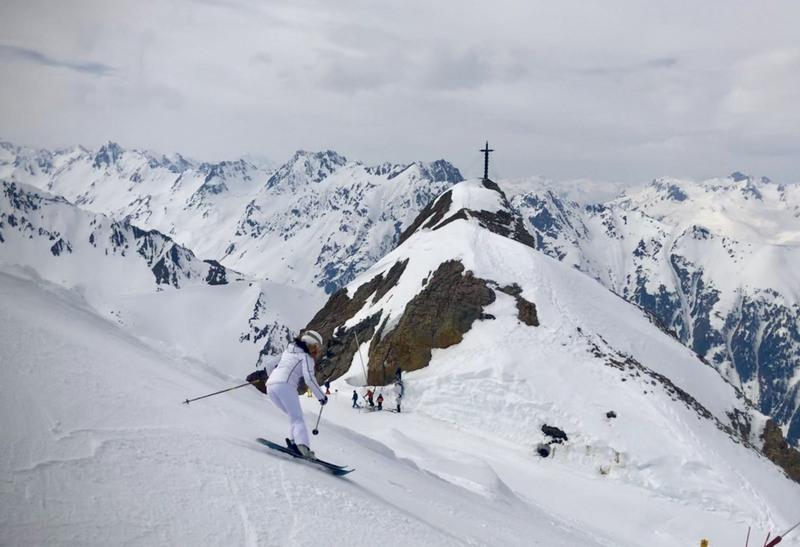 This humongous ski resort in Austria has mind-blowing lifts, high capacity, high speed, and highly scenic. 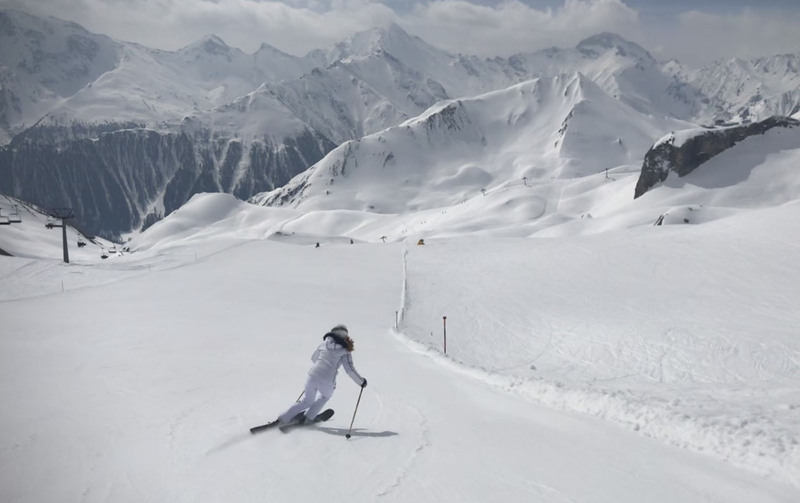 Ischgl offers vast steep terrain in all directions… north facing, east, west, and south into neighboring Samnaun. 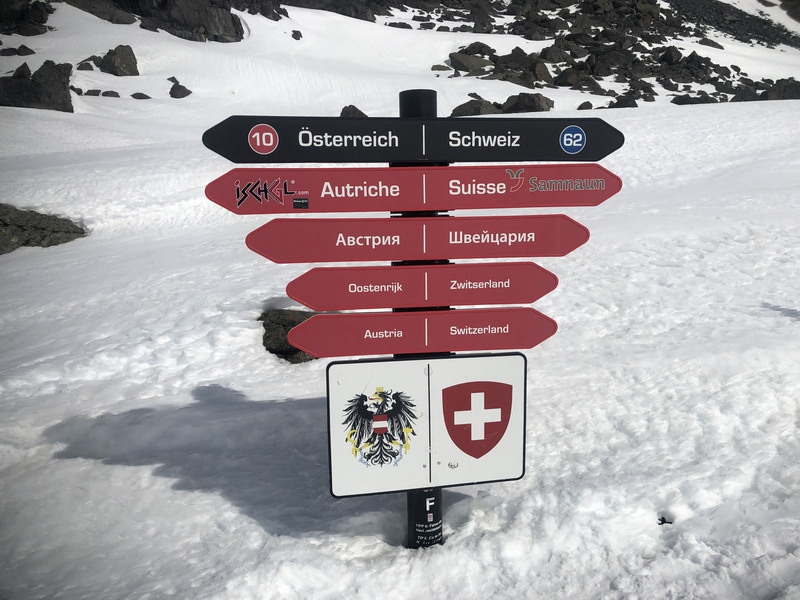 All on a huge alpine plateau soaring to The Greitspitz at 2,872 meters, 9,422′. Ischgl’s historic yet cosmopolitan ski town reaches the slopes via ultra modern trams up the dramatic canyon to the high alpine where lifts shooting off in every direction, you can even ski over the border into Switzerland and the ski resort of Samnaun – which is included in your Ischgl ski ticket, all part of the Paznaun ski region. Ischgl’s ski trails are quite challenging with the exception of the Idalp area – where the gondolas and trams arrive from the village. Here you find a hub of lifts and snow parks, Kinderland and ski school with learning terrain, and less pitched, well-groomed slopes. 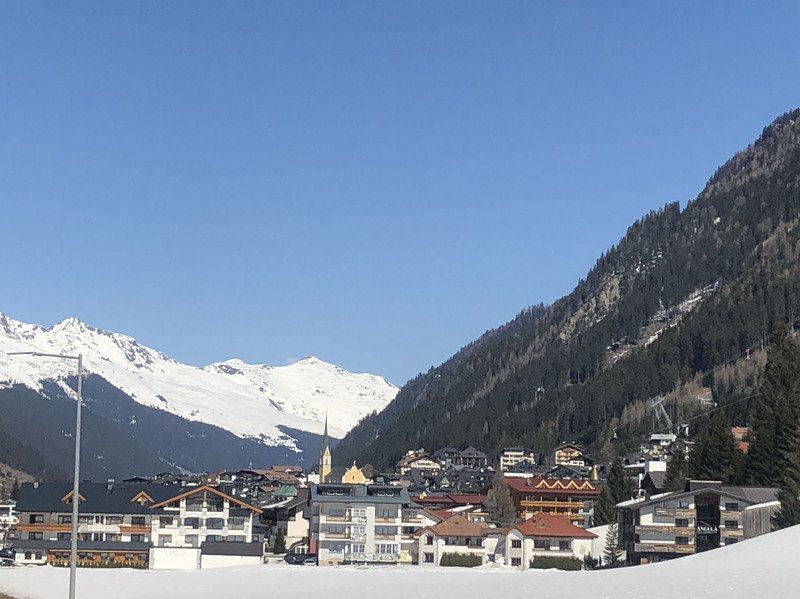 This is also where Ischgl hosts its huge music concerts on a big outdoor stage. 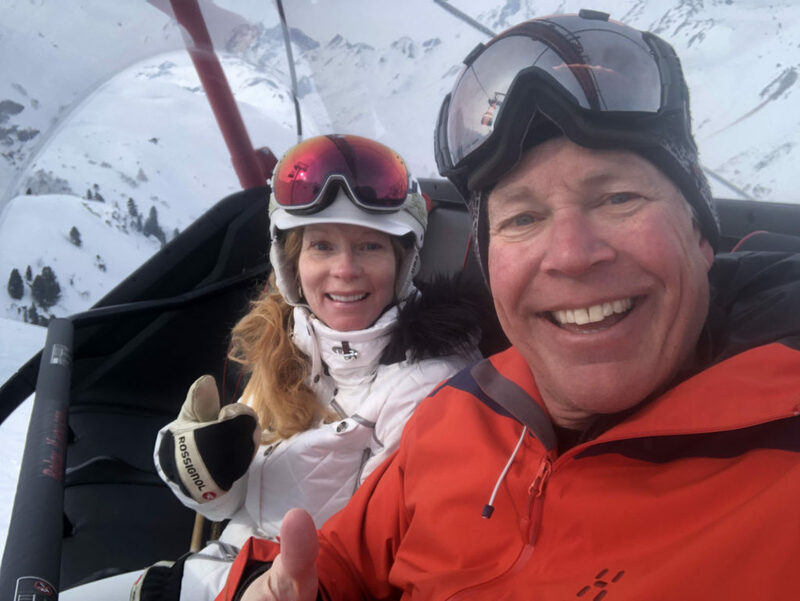 Ischgl’s End of the Season Top of The Mountain concerts are legendary with rock star performers like Lenny Krazitv, Rihanna, Elton John. 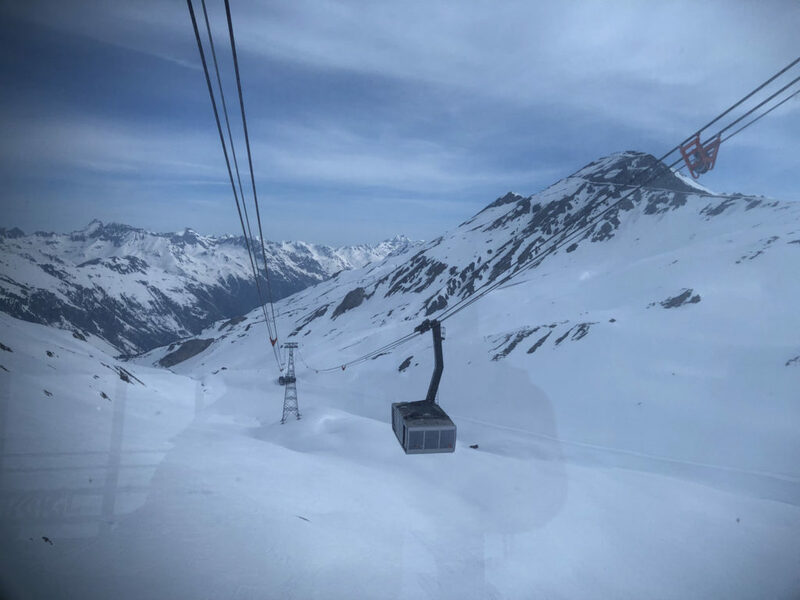 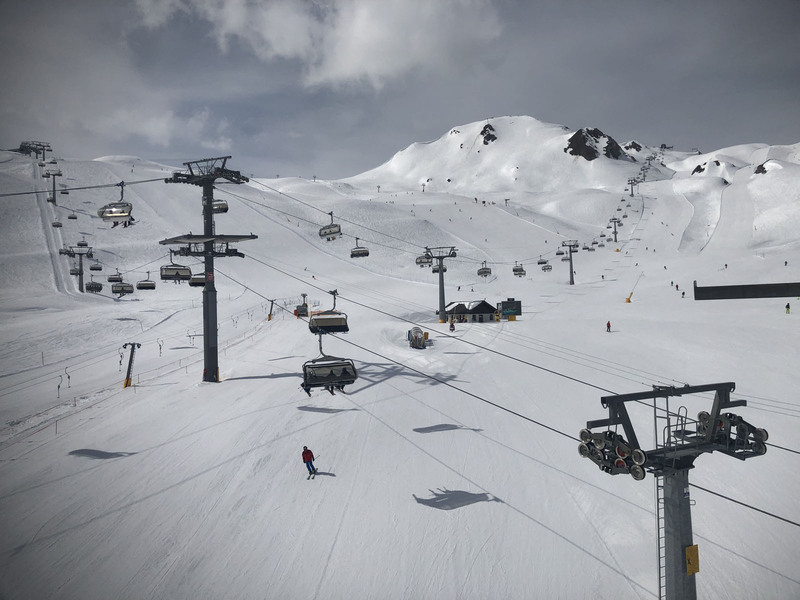 The Swiss side from Ischgl is easily reached in two lifts, has wider less steep trails, sun-exposed boulevards, making Samnaun a great place to ski the morning for softer snow. 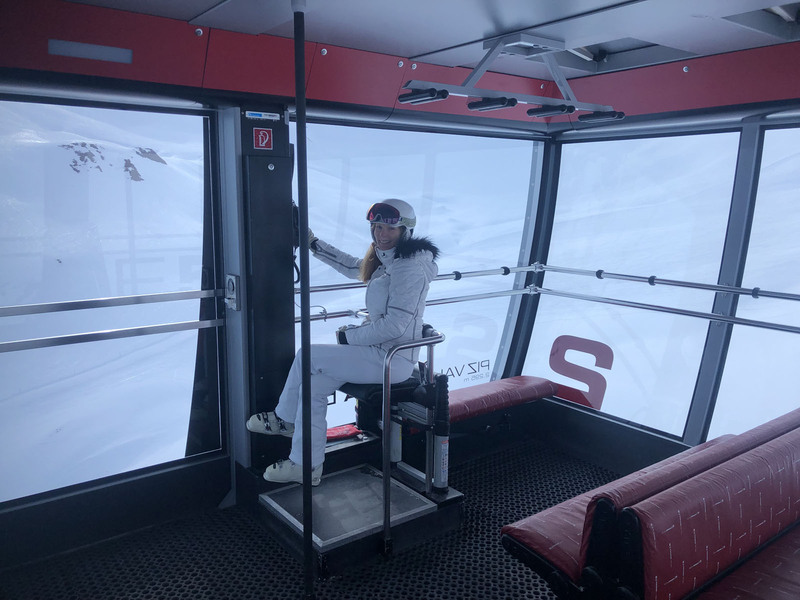 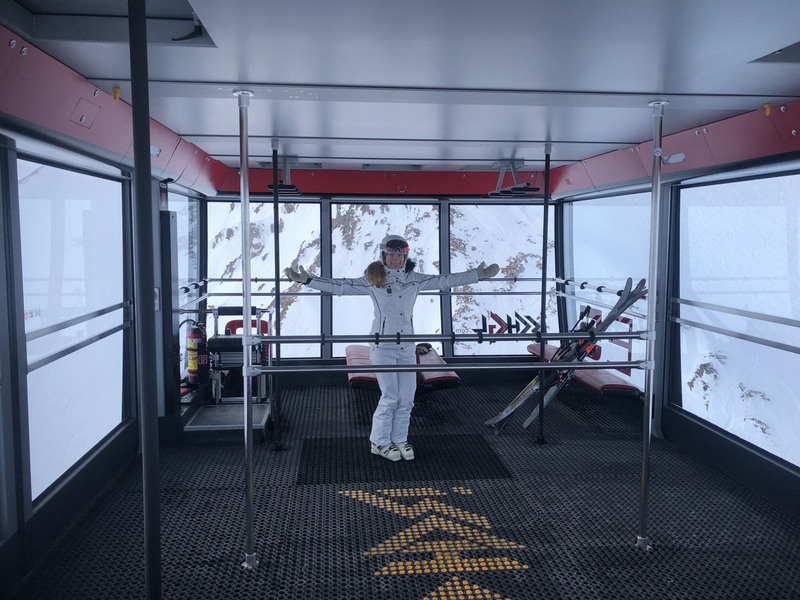 Samnaun – at the eastern end of Switzerland in the Graubunden region, not far from Lenzerheide, St Moritz, and Davos, has a myriad of lifts – including a double decker tram to handle the volume of skiers. Samnaun’s pleasant ski slopes emanate from mid mountain Alp Trida area where five ski lifts converge and head in every direction from this ski bowl. 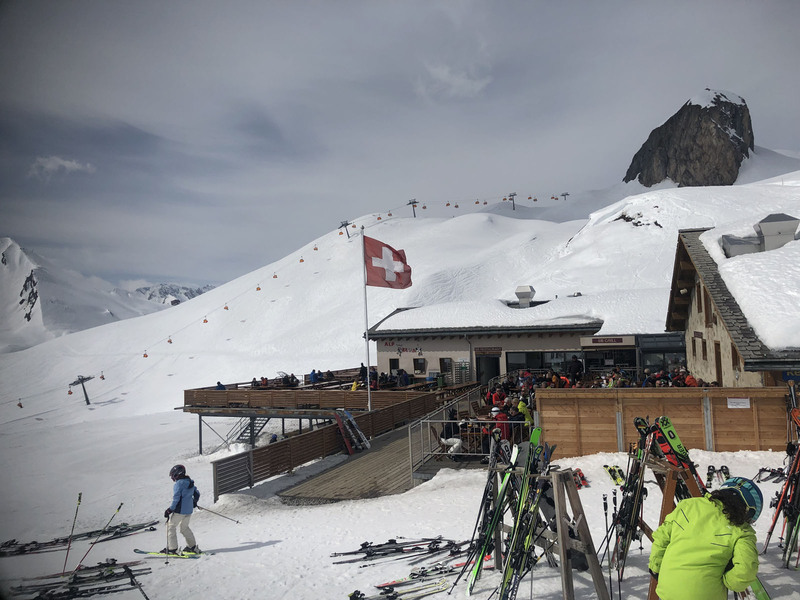 Samnaun has a few cool lodges for dining, like the Sattel Panorama, and the very modern Salaas circular glass lodge, plus more traditional Swiss chalets – Alp Bella and Alp Trida. 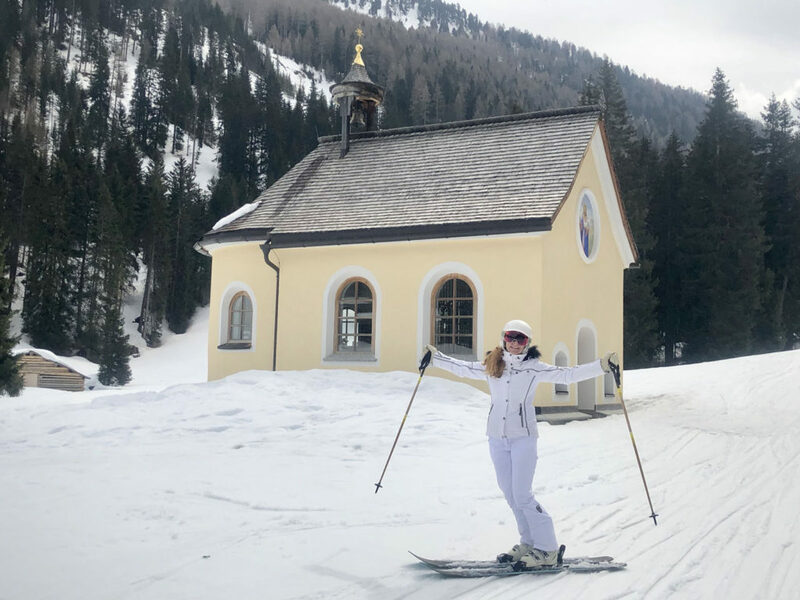 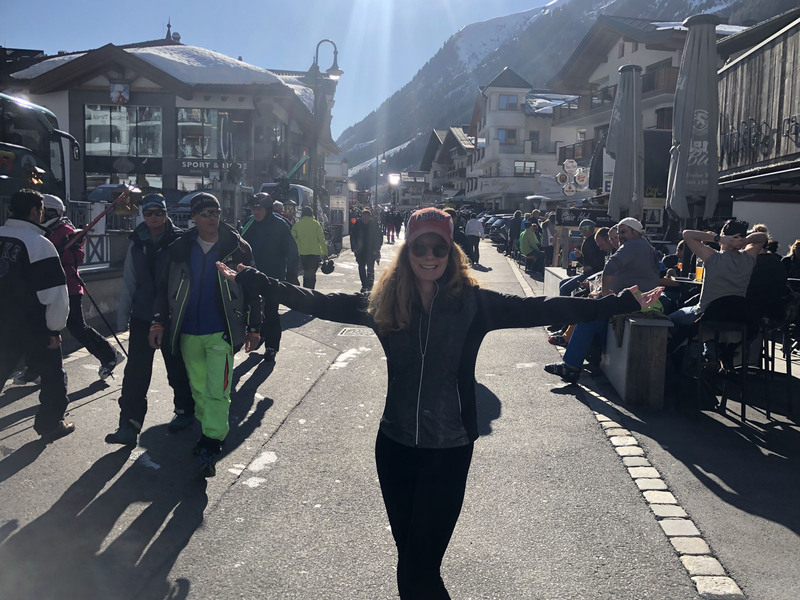 Its fun to ski to Switzerland from Austria for lunch as a goal. 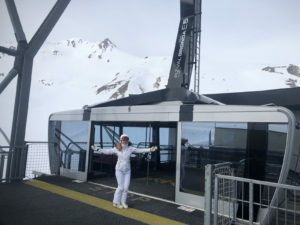 Of course Ischgl also has magnificent lodges for on mountain dining like the beautiful glass modern gondola station Pandorama, or a more rustic Heidelberger hut you are pulled to by snow mobile on Skidoo Safari from Gampenbahn for authentic Austrian lunch and a ski back to the resort trails. 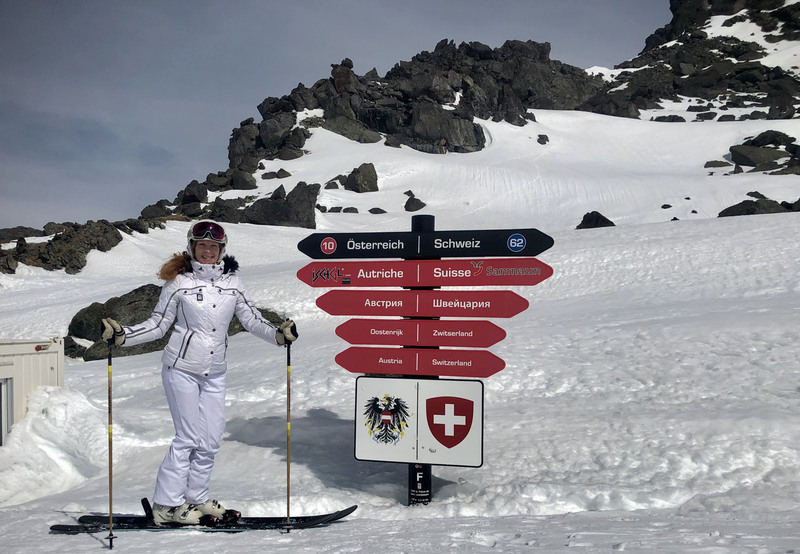 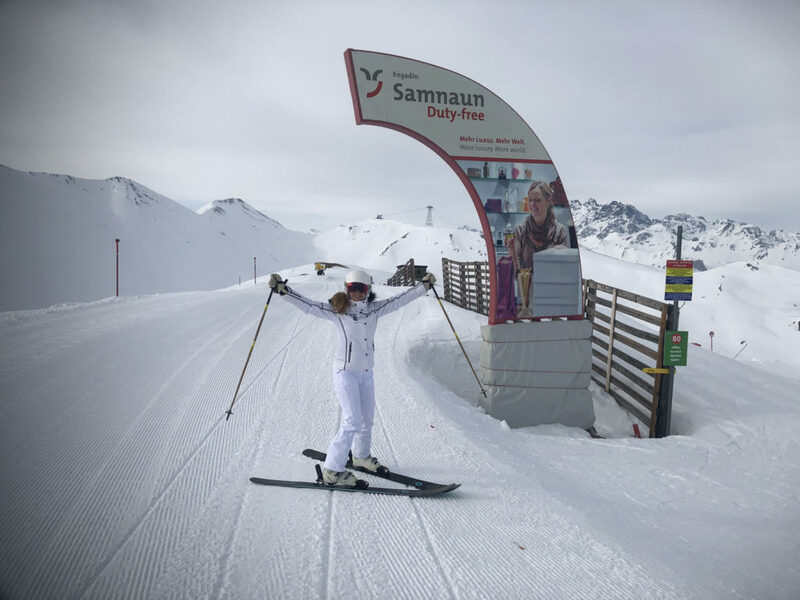 The Smugglers Ski Circuit is fun ski tour which crosses the border three times from Austria to Switzerland, a great way to see the vast terrain of both Ischgl and Samnaun (no passport required). 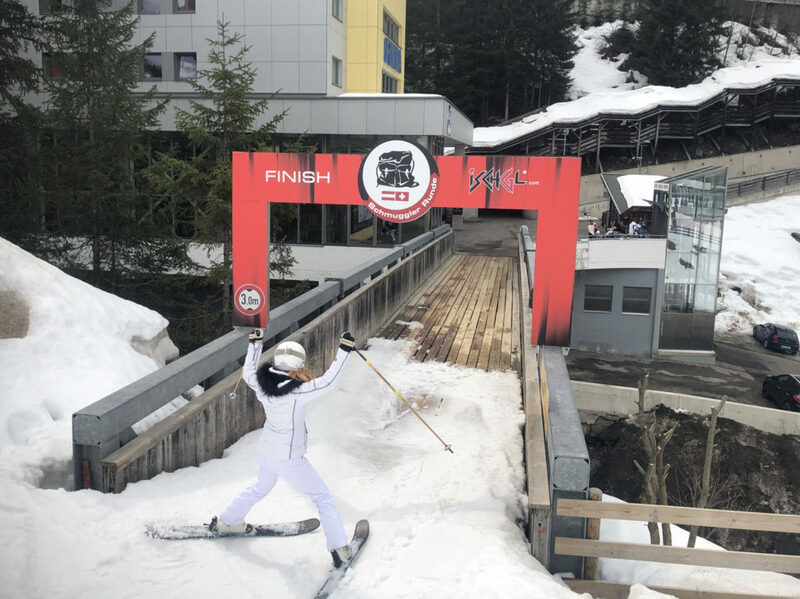 It’s one of the longest ski circuits in the world – like Italy’s Sella Ronda in the Dolomites. 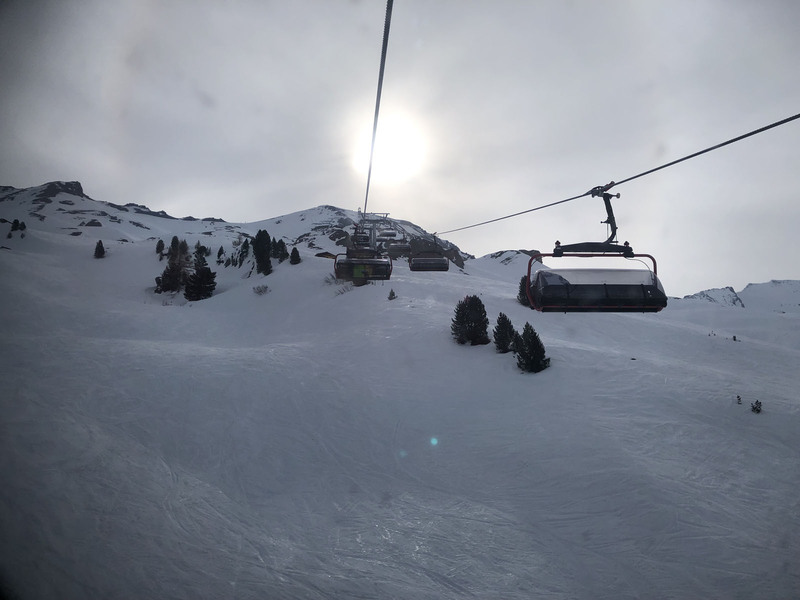 We easily achieved Smugglers Gold (the longest circuit) with extra laps on a few of our favorite lifts. 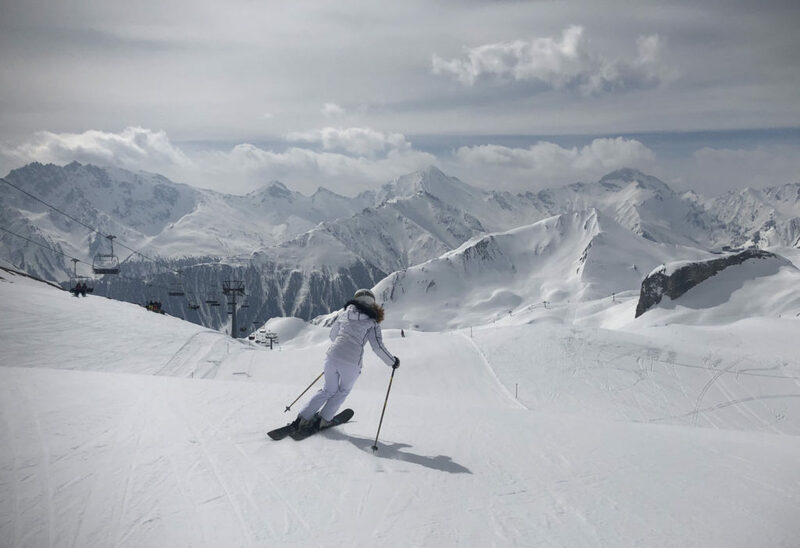 Gold level requires you ski 37 kilometers of pistes, 14 ski lifts, and a total of 59 kilometers of skiing. 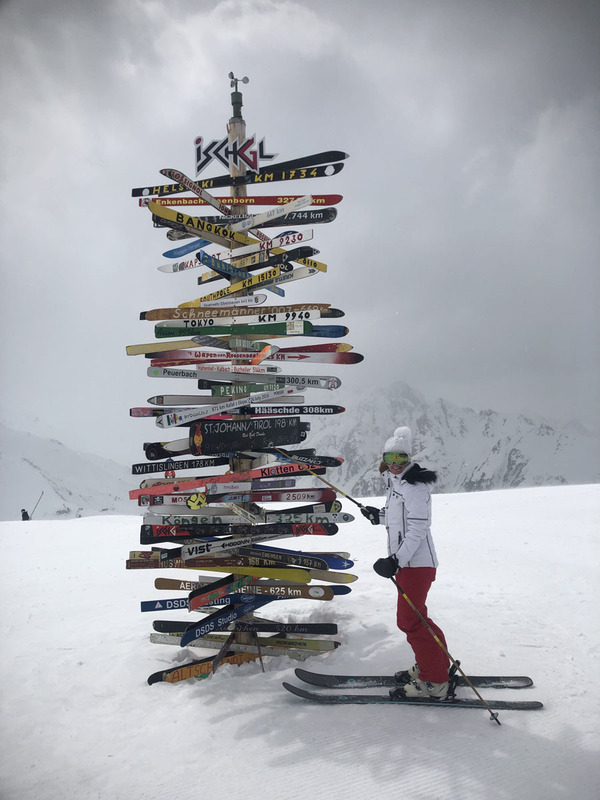 There’s also a Silver and Bronze level with a few less lifts and trails, download an app to track your route or follow the trail map. The history of Smuggling here dates back to Austrians bringing cheese, butter and fur into Samnaun Switzerland, in trade for imported coffee and spices, and tobacco. 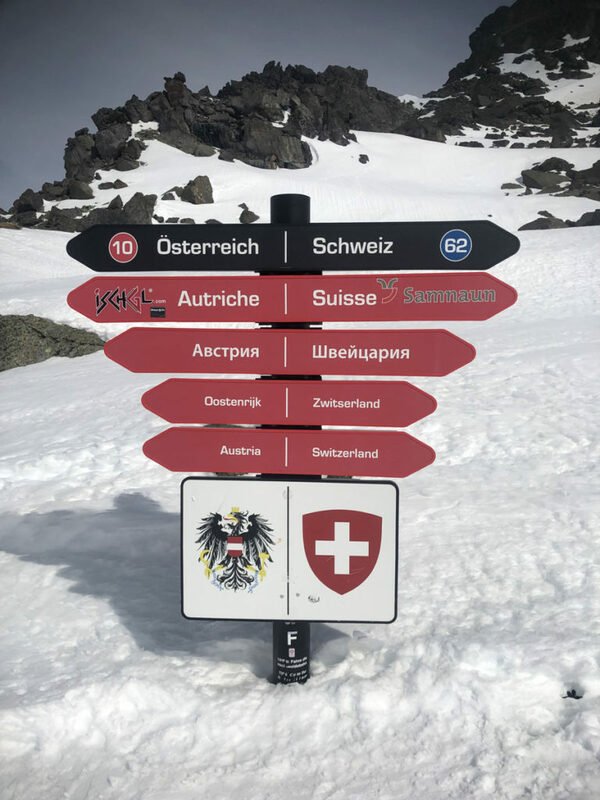 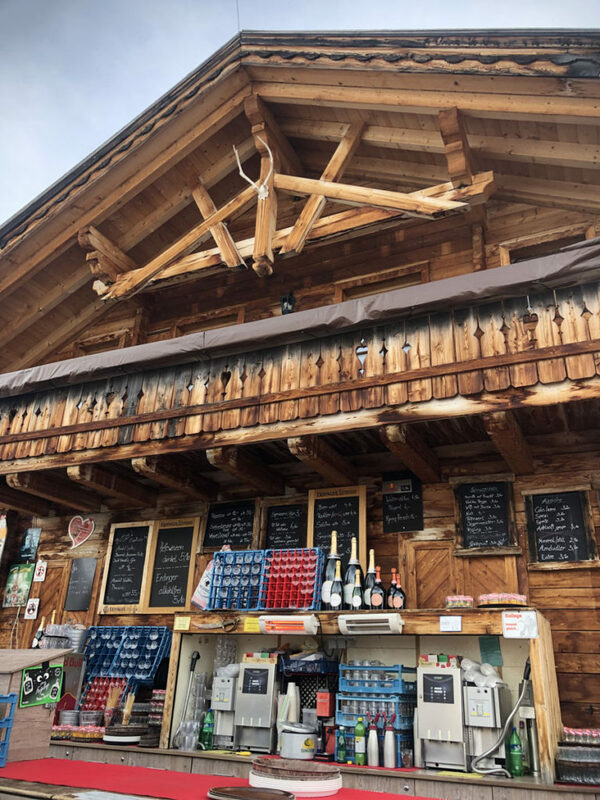 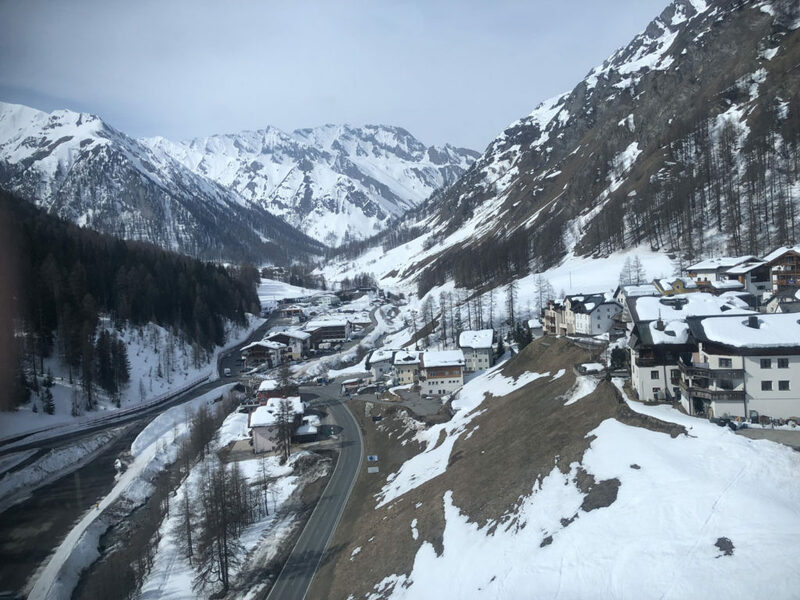 Ironically as you cross into the Swiss ski side now, you are assaulted with billboards promoting 40 duty free shops just off the ski slopes – Swiss watches, perfume and cigarettes in the ski resort village of Samnaun. 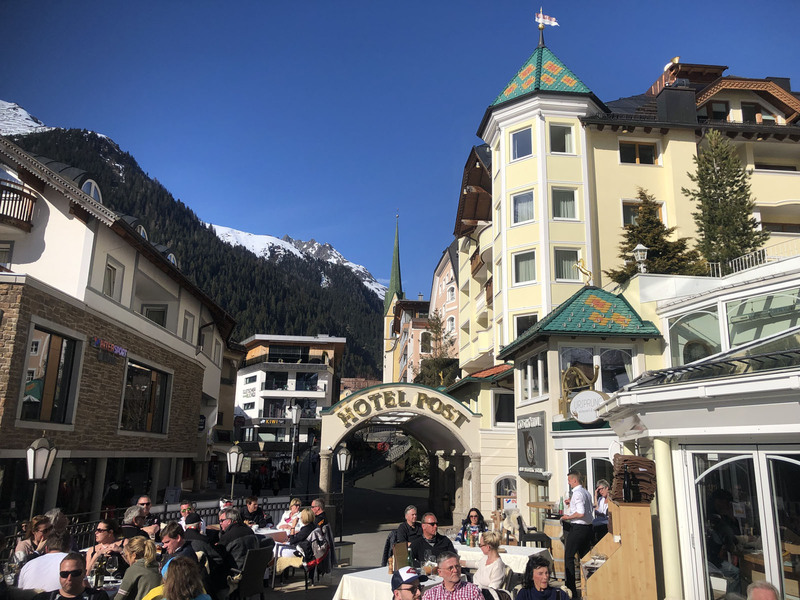 Stay in Ischgl. For skiers and non-skiers alike, Ischgl is a stylish cosmopolitan town with a long alpine history, evidenced by authentic chalets and church spires. 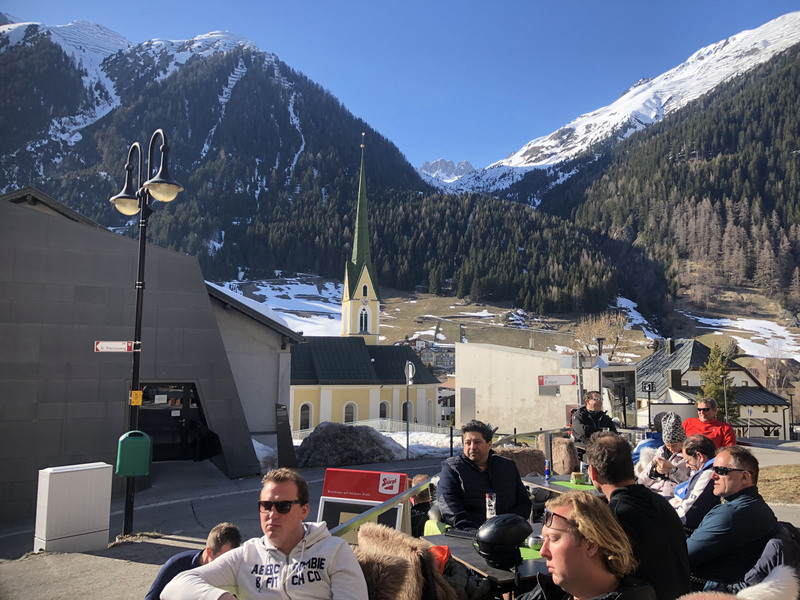 Apres ski in Ischgl is among the best in The Alps. 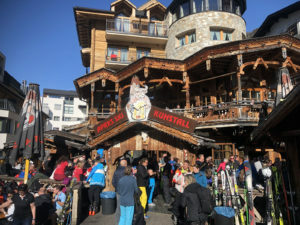 Its a daily party starting on the slopes at Paznauer Thaya, and continuing in the village into early evening, steps from the Silvretta Tram at Kuhstall – literally the “cowstall”, and the Hexen (witch bar) next door, also the slightly more swank Fire & Ice – its like aprés ski row with a bunch of lively bars and ski-boot partiers into the evening. Ischgl is vibrant – the mostly pedestrian streets fills with happy skiers and shoppers. 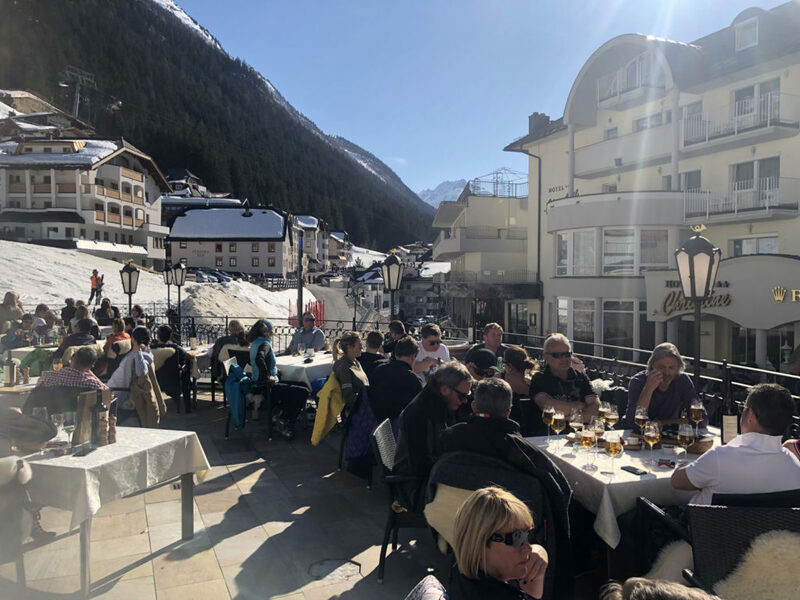 Sidewalk cafes drape their outdoor chairs and barstools with sheepskin, and music pours into the streets as well. 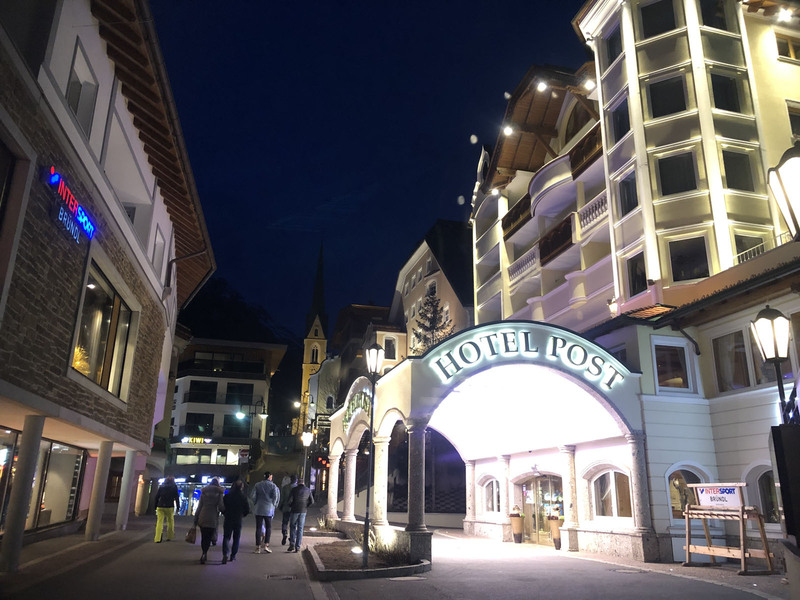 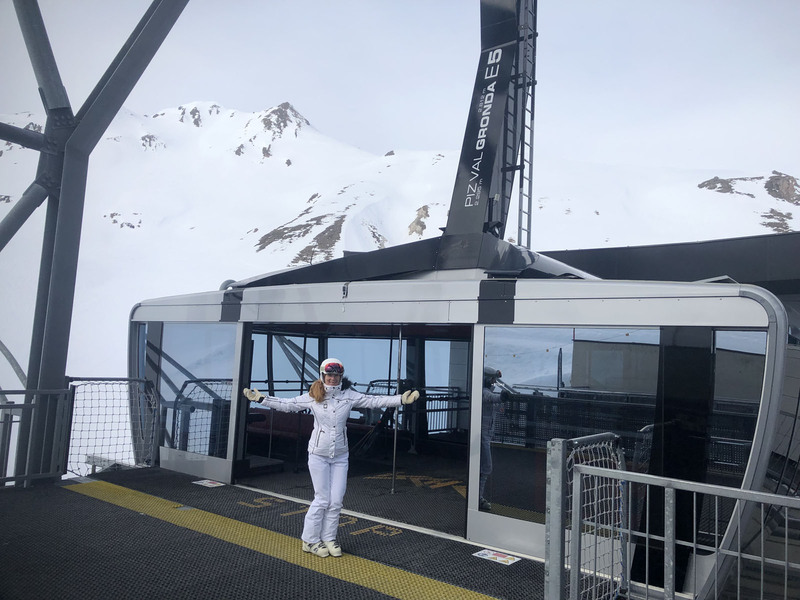 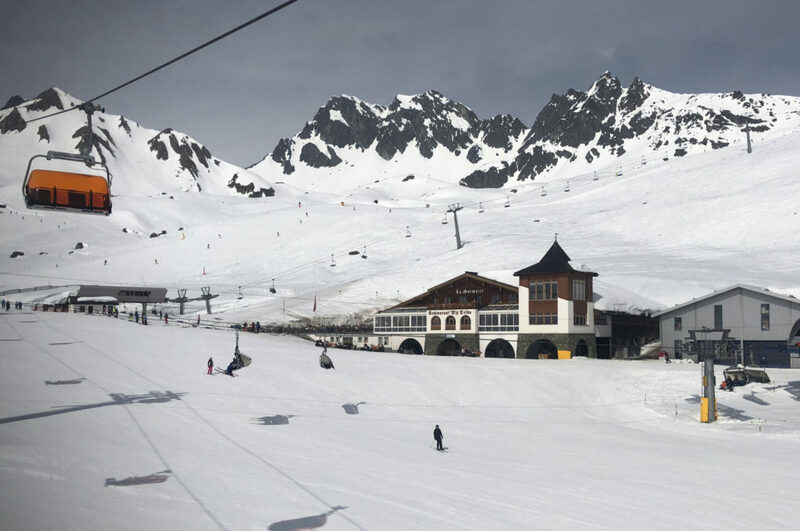 The cool ski lifts aren’t limited to the ski mountain, Ischgl village has pedestrian elevators and underground moving walkways that make most of the hotels within easy reach to the slopes, shops and village proper. 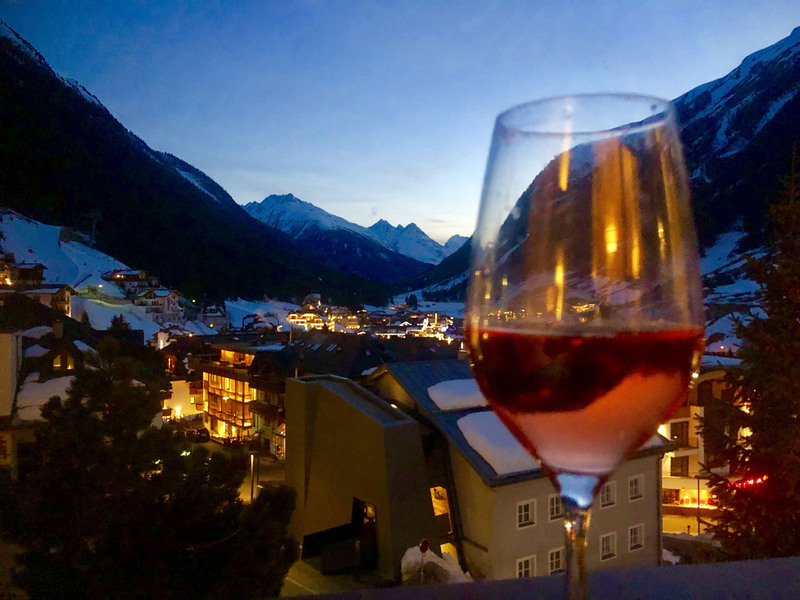 Ischgl five and four star hotels, like the Hotel Post, Fliana and Schlosshotel Ischgl, have fancy spas for those that don’t ski and just came to be pampered, to be seen and to aprés ski. 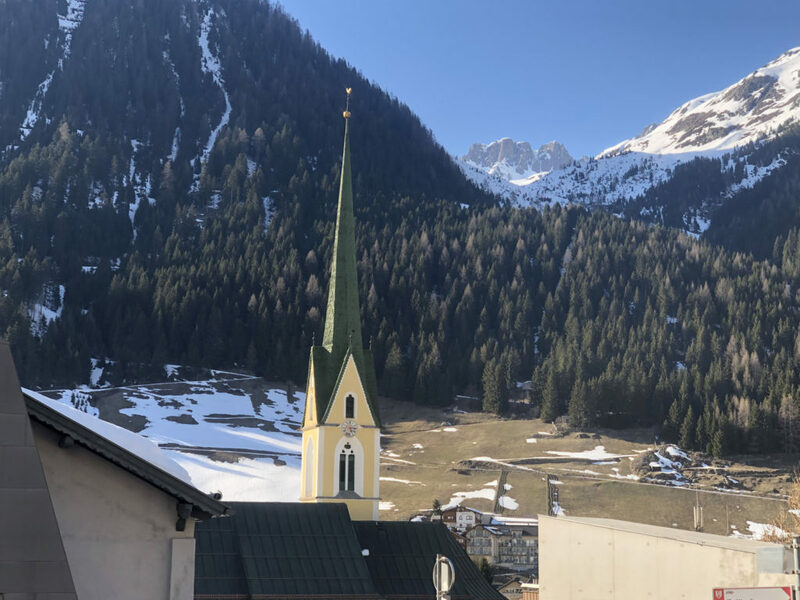 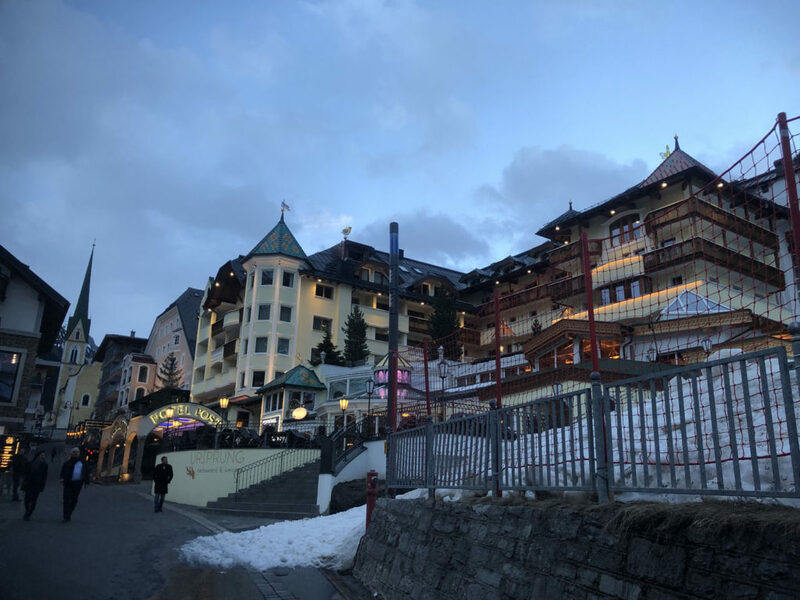 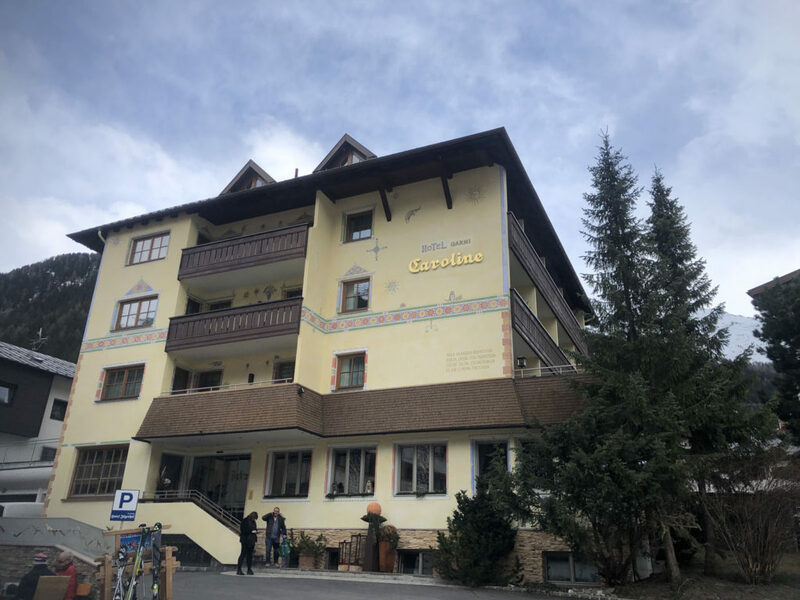 We stayed at Hotel Caroline, moderately priced, with balconies overlooking town, close to the elevator to the ski lift, serving a wonderful breakfast, just steps to the heart of Ischgl’s village. 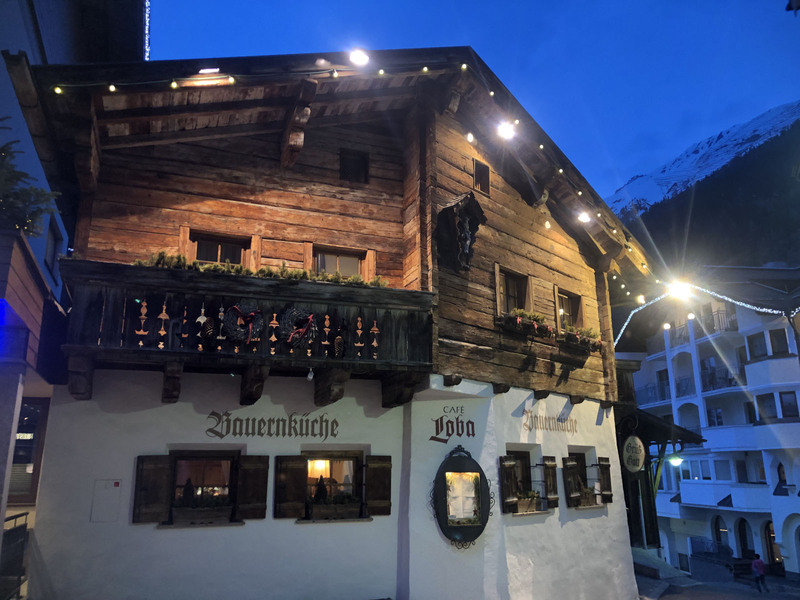 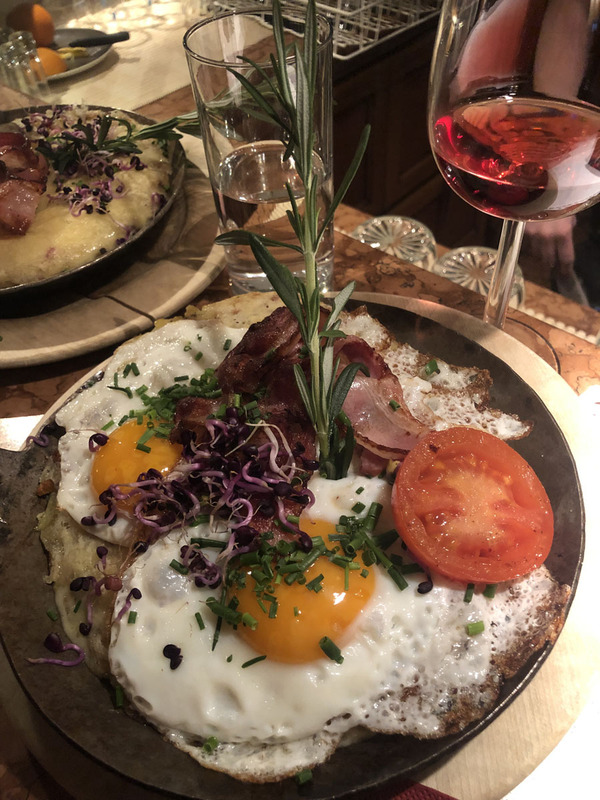 Ischgl has great restaurants from cozy chalets serving fondue and rösti like Loba, delicious pasta and pizza at the charming Barafalla in the five-star Silvretta Hotel, to swank pricey dining spots like Stiar and Sunnalm. Word of caution, the slopes descending into Ischgl at ski day’s end aget busy with bumps, skiers and partiers no longer skiing as competently as they did before imbibing. 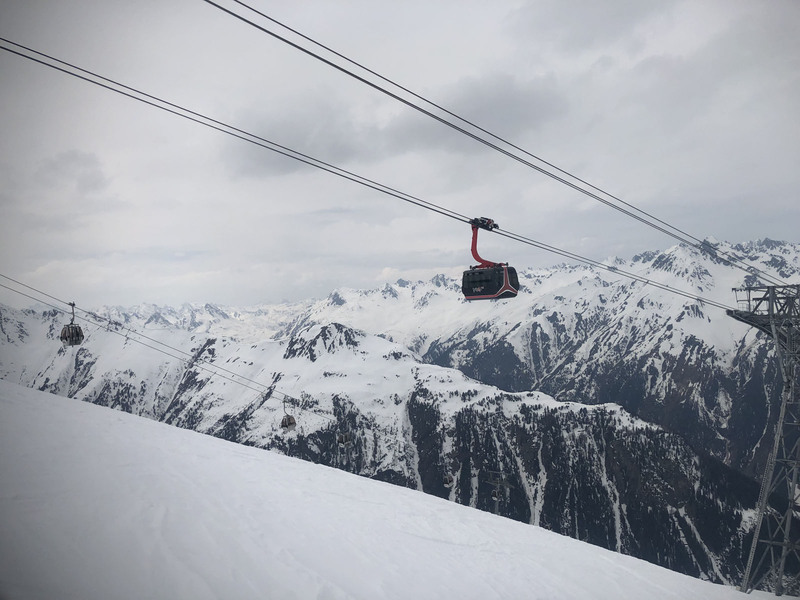 Put your pride aside and download on the beautiful cable cars for a safe return to the village if you’re not up for the “Run to the Valley” on Trail #1. 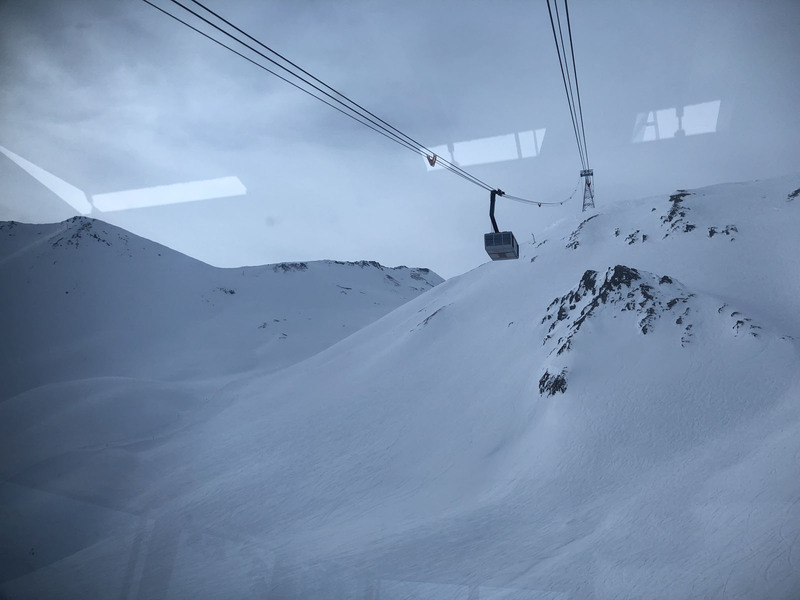 Also, Ischgl gets busy on holidays, with so many high capacity high speed lift. 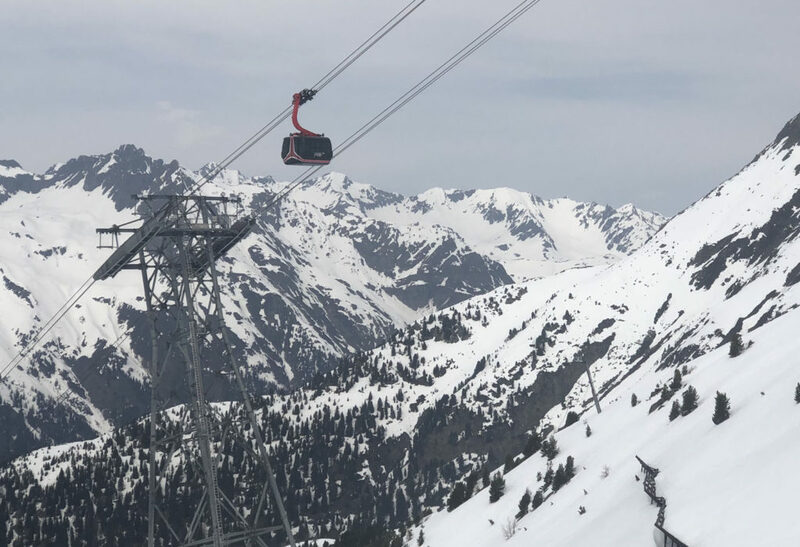 We visited in April and loved having the mountain more to ourselves, with still great snow and lively aprés ski and local atmosphere. 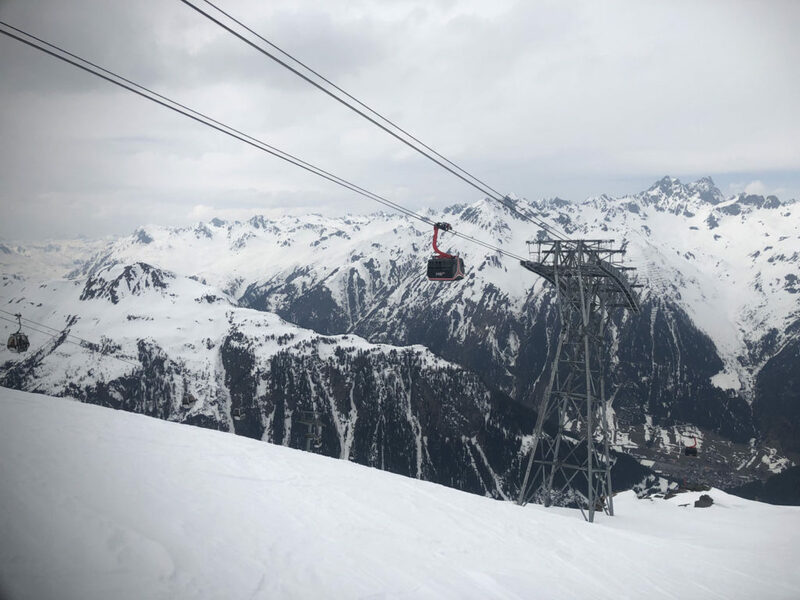 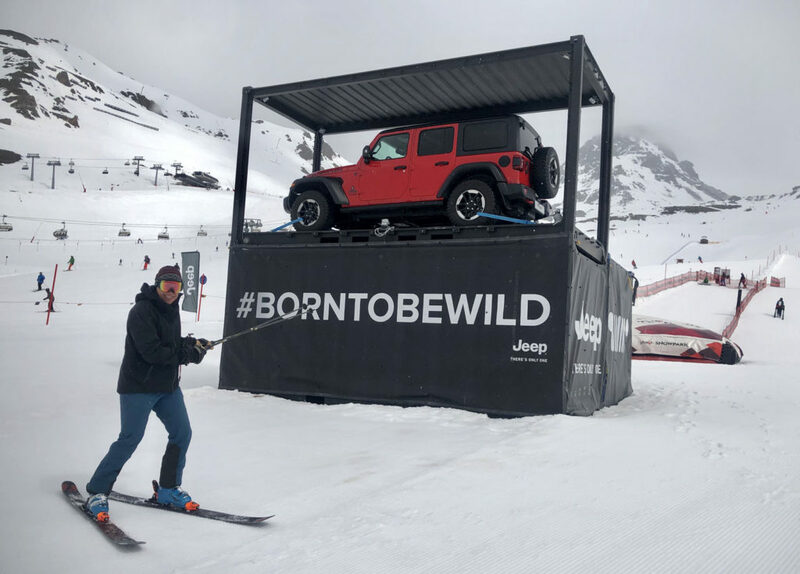 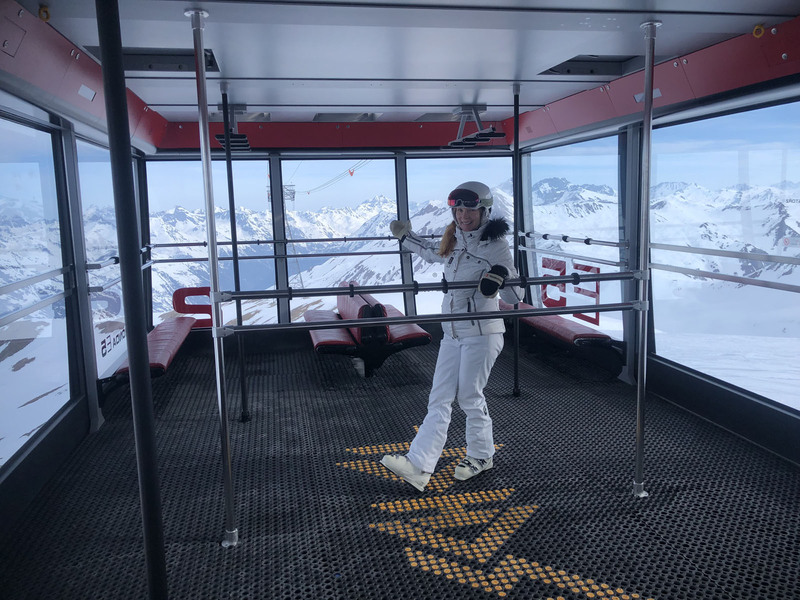 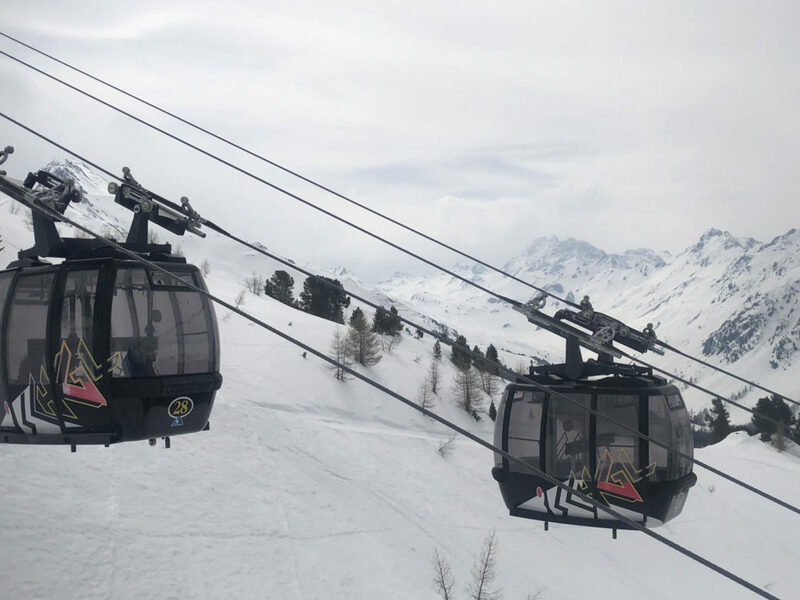 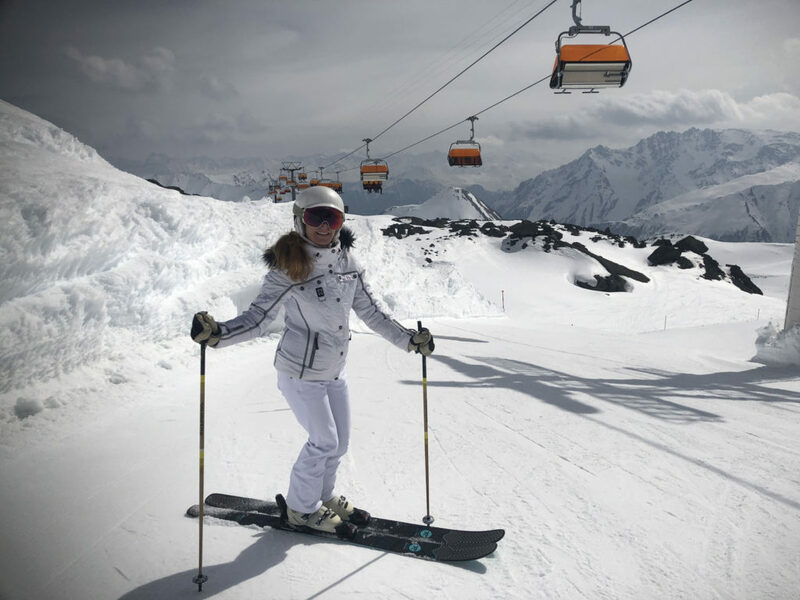 Non skiers can ride the cable cars up to Ischgl’s epicenter and enjoy on snow activities like a crazy zip line, sledding, and winter wandering on paths to the village. 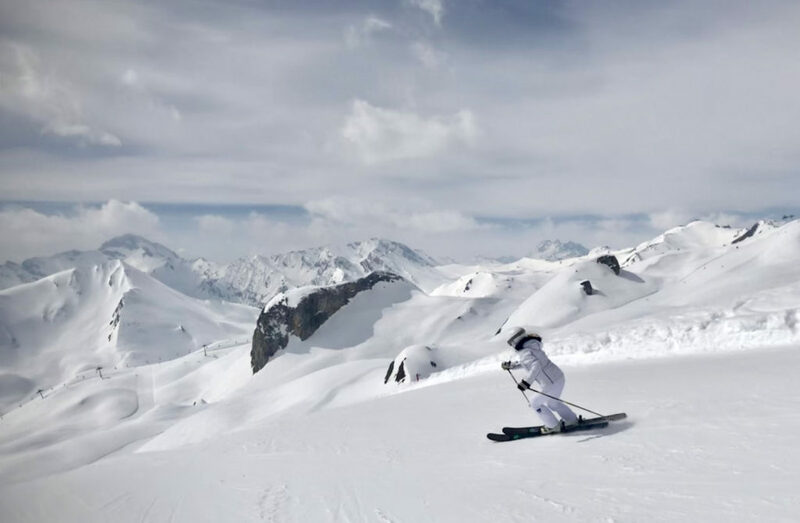 A ski holiday in Ischgl is non-stop fun, their slogan “relax. 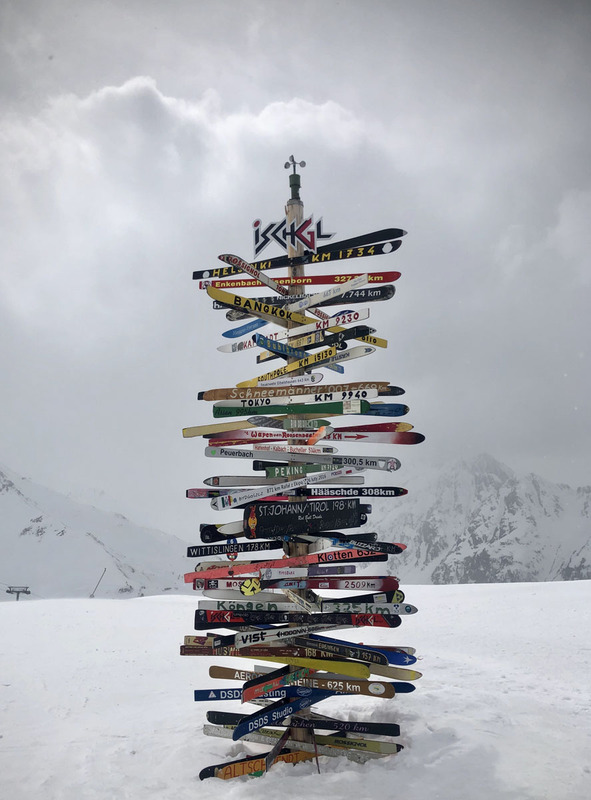 if you can,” funny but true, there is much to ski and do. 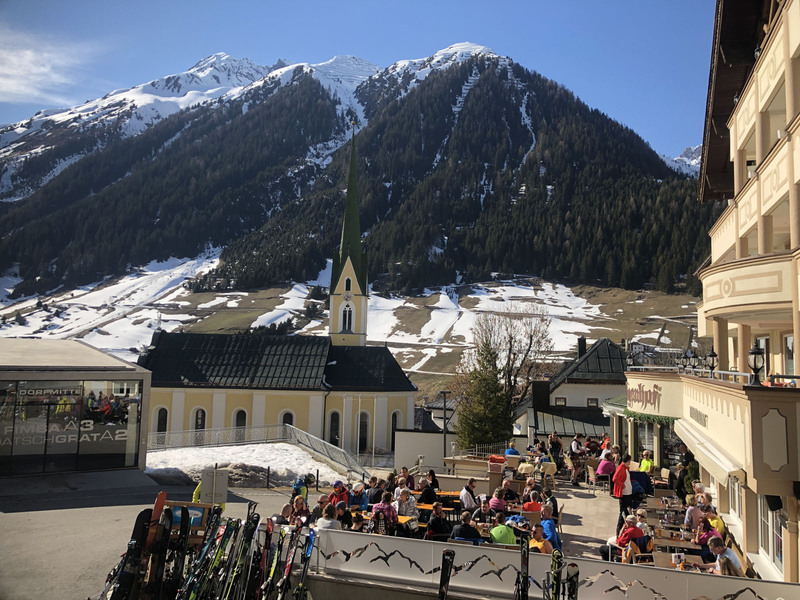 Ischgl is not ideal for young families given the steeper terrain and sheer size of the mountain resort with so many lifts, never mind Ischgl’s party scene. 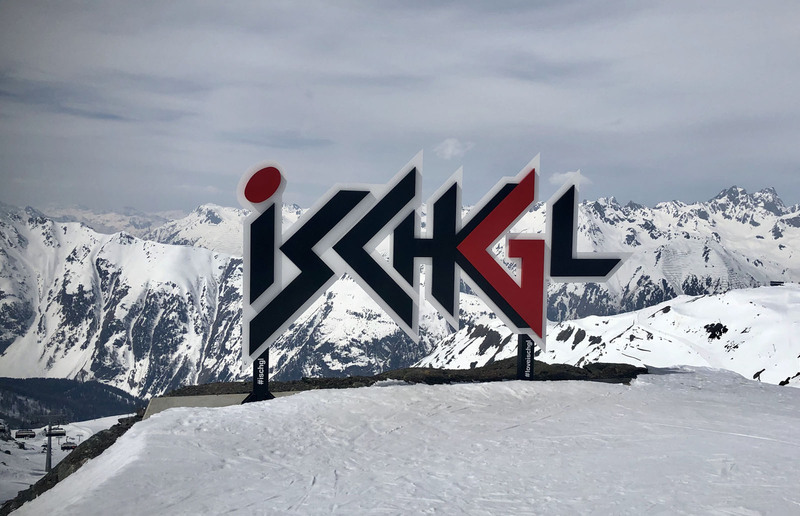 Ischgl is best saved for when your kids are young adults – then they will love you for taking them to Ischgl. 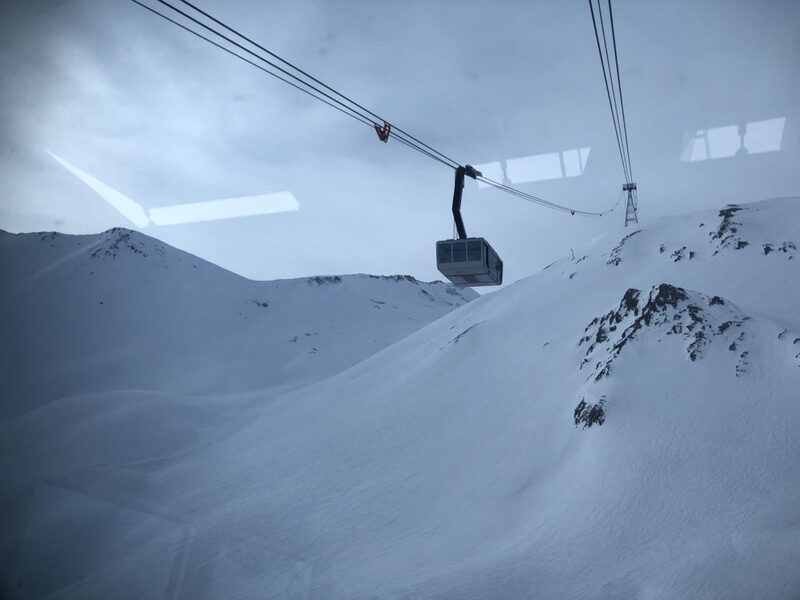 The Paznaun ski region has 73 ski lifts including Ischgl and nearby ski areas of Galtür, Kappl and See, all part of the Silvretta ski region.